New Hampshire requires anyone convicted of a DWI offense to attend an Impaired Driver Care Management Program (IDCMP) in order to determine what the offender may require in terms of educations, treatment or recovery services. In additions, a DWI conviction in New Hampshire will also result in the mandatory installation of an ignition interlock device (IID) for all offenders who complete the stated amount of time for a license suspension, which includes any aggravated DWI or subsequent DWI offenses, as well as some first-time DWI offenses. An ignition interlock device (IID) is a system that is installed into the vehicle of convicted DWI offenders that will test for the presence of alcohol in the bloodstream. This blood alcohol concentration (BAC) test occurs when the driver blows into the device, causing a vehicle lock the ignition system if there is an indication of the presence of alcohol in the blood. IIDs also test for alcohol while a vehicle is in use. If a driver tests positive for alcohol, the device will cause the vehicle’s lights to flash and an alarm to sound until the vehicle is turned off or a “clean” reading is recorded by the device. 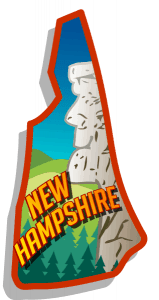 First-time DWI offenders in New Hampshire are subject to the requirements of the IDCMP program in order to reduce the length of time a license is suspended, which can vary between nine months to two years, depending on the severity of the DWI conviction. This is in addition to fines ranging from $500-$750 and possible jail time for aggravated DWI convictions. Second DWI offenses in New Hampshire require a minimum of 30 days in jail, plus seven days in a Multiple DWI Offender Intervention Detention Center. Driving privileges can be suspended for a minimum of three years with the possibility of an ignition interlock installation after the suspension period is over. Third-time DWI convictions in New Hampshire will cause an indefinite driver’s license suspension that may be removed at the court’s discretion after seven years, and could result in the installation of an IID. Jail time for these offenses is 180 days minimum, plus a mandatory $750 fine and a minimum 28-day stay in a residential treatment program. Any Aggravated DWI charge increases the penalties associated with the DWI conviction.